Los Angeles at night borders on magical, especially for a small town southern boy: desert heat, lights, noise, busyness, the glowing sky. I dropped the top on my rattletrap convertible and soaked it all in. This was home now. 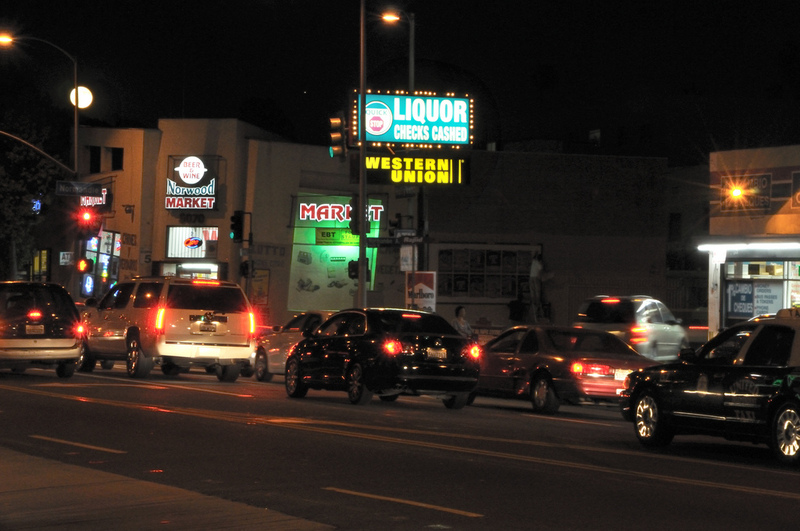 I idled in the left turn lane, waiting to get onto Sunset Boulevard. Guys in cowboy boots and shredded acid wash jeans walked alongside girls with mile high bangs, on their way to the party that never ended on the Strip. The Mercedes idled quietly. Even the windows were black. I threw my MG into reverse, backed away, then jammed it into gear and took off down Sunset with one final flourish of the finger. Rich people. They thought they owned the whole damned city. I spent all day every day in service to the Mercedes people, running their errands, rushing film to their houses, kissing their asses. Meanwhile, the hair metal kids didn’t have a care in the world beyond where their can of Aqua Net went. They flopped on couches or lived off their Mercedes daddies’ money or something; regardless, they didn’t have to work to survive in this city. They weren’t servants to the wealthy producers in their blacked out luxury cars. But wait a second: Film money wasn’t the only money in Los Angeles. Drugs, gangs, mobsters — L.A. was home to a seedy underbelly worthy of James Ellroy. Those guys didn’t black out their windows to conceal their celebrity, but rather to hide the shot that you never saw coming. I checked my rear-view mirror. The Mercedes hunched behind me, but that made sense; after all, we were both turning onto Sunset when we nearly collided. I took a right up a side street. The Mercedes did, too, but that also may have been a coincidence. I pulled into the Rockin’ Ralph’s parking lot. The Mercedes followed. I drove straight through to the exit on the far side of the lot. So did the Mercedes. This thing was on. I stabbed the gas pedal and off we went, revving and squealing our way through Hollywood, weaving through traffic, horns blaring. All we needed were a couple of fruit carts and two guys carrying a pane of glass across Fountain Avenue to complete the pastiche. Mel Gibson clinging to my hood would have been a nice touch, too. Minutes flew past. Every time I thought I’d lost my pursuer, I’d check my mirror a couple of blocks later and the menacing beast was back on my tail. The chase ended at a busy intersection. I was pinned in by the rush of traffic, nowhere to go. The blacked out Mercedes rolled up next to me silently. For a brief moment I considered believing in God, just so that I could pray for a painless death. The dark passenger window slowly descended. I braced myself for the muzzle flash. “On La Brea and Sunset. I didn’t mean to cut you off,” she said. The light turned green and she proceeded westbound at a sensible speed. For years I’ve wondered whether that woman was working on closure with her therapist or some such. I’ve also wondered whether I’m the biggest chickenshit on the planet. The safe money is on yes to both.